Around late July or early August, if you’re up early and have an unobstructed view to the east, be sure to look in that direction in the hour before dawn. You might find a familiar figure – a constellation that always returns to the sky around this time of year. It’s the beautiful constellation Orion the Hunter – recently behind the sun as seen from our earthly vantage point – now ascending once more in the east before sunrise. The Hunter appears each northern winter as a mighty constellation arcing across the south during the evening hours. Many people see it then, and notice it, because the pattern of Orion’s stars is so distinctive. But, at the crack of dawn in late summer, you can spot Orion in the east. Thus Orion has been called the ghost of the shimmering summer dawn. The Hunter rises on his side, with his three Belt stars – Mintaka, Alnitak and Alnilam – pointing straight up. The constellation Orion as viewed at morning dawn in early August. Image via Flickr user Michael C. Rael. Also, notice the star Aldebaran in the constellation Taurus the Bull. Aldebaran is the brightest star in Taurus the Bull. It’s said to be the Bull’s fiery red eye. See the V-shaped pattern of stars around Aldebaran? This pattern represents the Bull’s face. In skylore, Orion is said to be holding up a great shield … fending off the charging Bull. Can you imagine this by looking at the chart at top? It’s easy to imagine when you look at the real sky before dawn at this time of year. 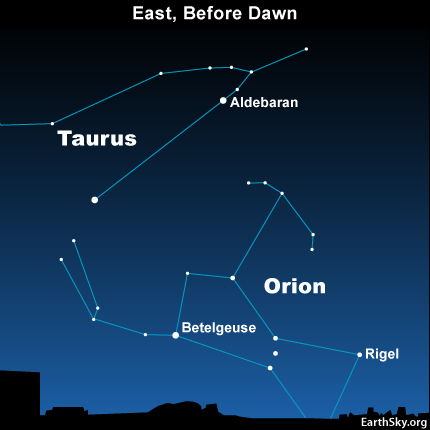 Bottom line: The return of Orion and Taurus to your predawn sky happens around late July or early August every year. 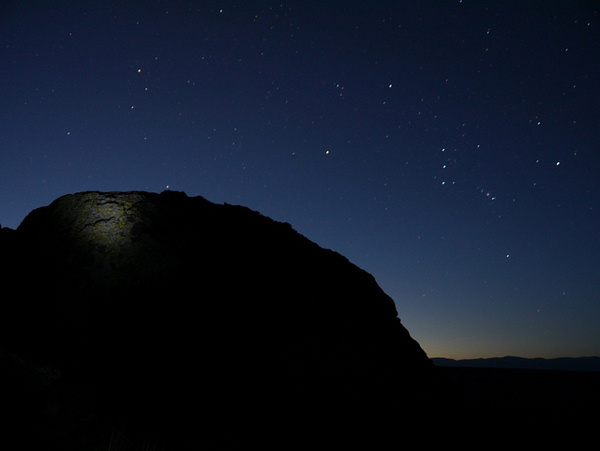 In the Northern Hemisphere, Orion is sometimes called the ghost of the summer dawn.